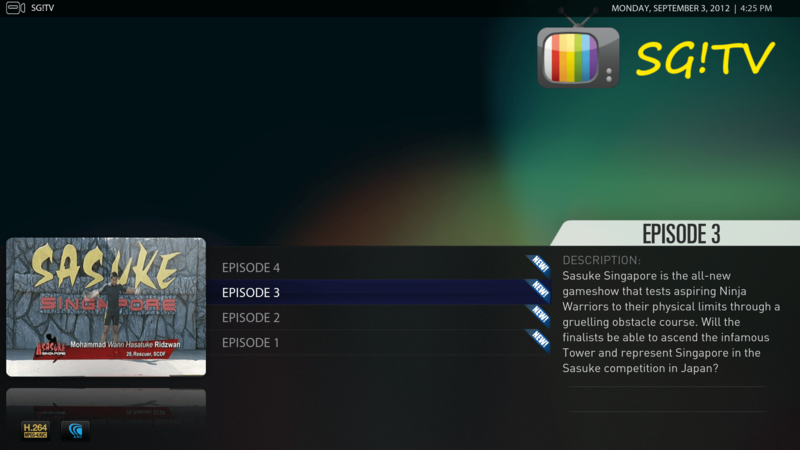 The SG!TV Plugin or Channel for XBMC/Plex is launched. 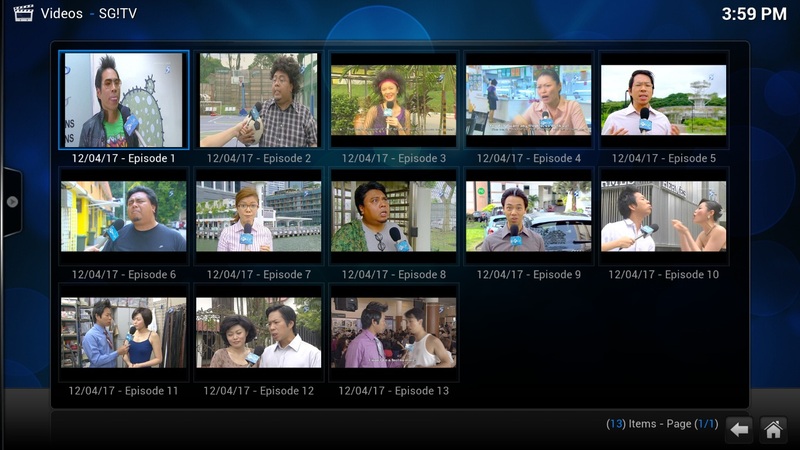 SG!TV allows you to re-watch or catch up the local Mediacorp (Singapore) shows that you have missed direct from your HTPC client. Miss last night channel 8 drama serial? Fire up the app and look for the show or find it through the latest highlights. This is the current beta version but both browsing of channels and the latest shows are all working. It is currently working for Singapore viewers only as I believe the website does check for the IP location before allowing access to the stream. Also, it works great for our overseas friend as well, so if you are a Singaporean staying aboard, this is a great way to watch or catch up your favourite Mediacorp shows. 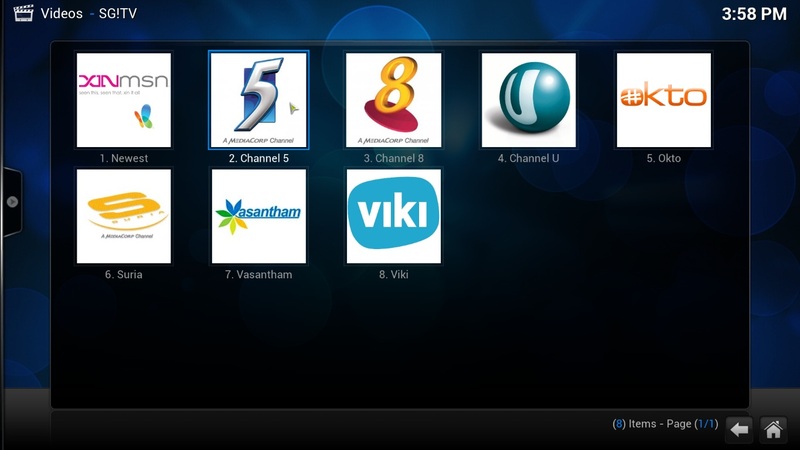 The screenshots below show the XBMC client and the local channels that are available. Some major updates to the SG!TV Plugin. 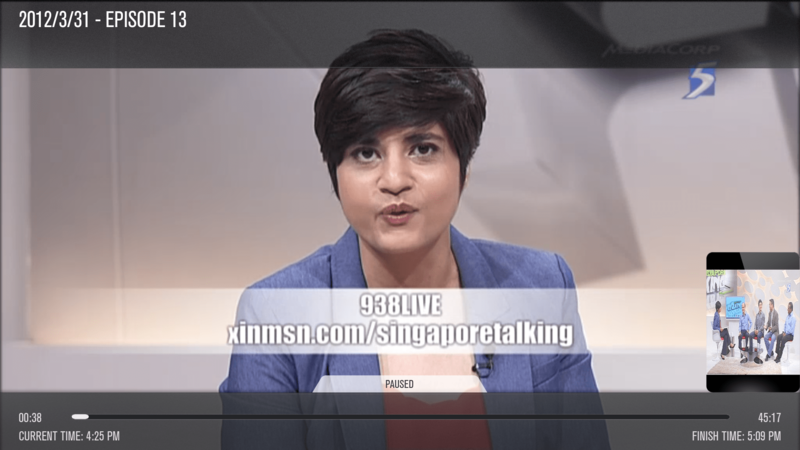 It now shows Channelnewsasia video and live feed if you are based in Singapore. There’s also local wahbanana channel for some random laughs. Viddsee is a local Singapore start up that curates the best short films from Asia. Viddsee serves up seven recommended short Asian films for your viewing pleasure each week on the home screen. Currently, both the XBMC and Plex plugins are at a similar stage of development. It has currently been tested on both the Windows version of XBMC and Plex. As XBMC uses a unified software base, it should work across all the platforms. As for Plex, there are some problems in playing the stream directly through clients that do not support the stream protocol and the transcoding option should be set to preferred. This was verified on my Android devices. Next up are the screenshots of the Plex channel. Unable to get episodes of shows if it span across multiple pages. Option to select stream quality. Currently it plays the highest available. Search function to be incorporated. Appreciate if you do not direct link to the files, instead refer them to my website, thanks. Also, if you like the plugin, help me share or like this page on Facebook so that the word gets around. Thank you! Thanks for reading. I hope you like the Plugin / Addon and if you have any comments or suggestions, I look forward to receiving your feedback. Yes, It worked on my raspbmc… Thanks! Great! I am a Singapore TV fans from China mainland. I can catch up with my favourite TV shows with my rpi. Wish the episodes are arrange in order. Some episodes have additional titles while others dont. Chinese characters will be shown as a black bar in plex. Thanks Khairul for your comments. Will strive to improve it in the next version! hi kaer, will the episode update itself or do we have to refresh on our own? Is this addon still working? I’m trying it on XBMC on Android, I can load the episode lists but i get script error when trying to play it. I’m also in the US so I’m not sure if there’s ip restrictions thats blocking it. There was a problem with the updated XBMC file. The plugin has been fixed, please help download again. Oh, and there shouldn’t be an issue if you are in the US. Hi…I tested the addon and it works great. However, I’m wondering why for the ch 8 dramas, there are only 16 eps loaded? I notice it happens for most dramas. The current “It takes two” doesn’t start from ep 1 but starts from ep 16. The drama “game plan” only has the first 16eps no finale. I recommend Plex or Boxee. Plex is a great slick interface. The only drawback is they are a little behind Boxee in terms of cutting edge features (they were a few months behind getting netflix, their torrent support still doesn’t include RSS feeds and such). Still, if all you want to do is have a remote control client for netflix, hulu, and joost, Plex is probably the best one right now. They also have much better SMB support than Boxee if you are planning on accessing network shares. Has anyone used http://www.happy-vpn.com/buy-uk-vpn.php ? I am looking for a Happy VPN review. I want to watch BBC from Singapore and this VPN looks good but I still want to do my research! May I know if the same plugin works on XBMCbuntu version (Eden)? If yes, how do I go about installing it? Thanks! I managed to install it. Thanks! Hi, any plans on adding this to a proper repository so updates can be handled automatically? Any update to this? Seems like there is a 120 items limit when I am browsing. Looking back at this app after 2 years. It dont seem to be working anymore. aNy plans to update it? Hi Khairul, thanks for the post – yes, there seems to be a problem with PLEX but it’s still working fine with XBMC. I will try to fix it soon. My bad – I updated the XBMC along the Plex version for yul000 previously. Will update the download links soon. Will see if I can put it on a repository too. The links have been updated to the latest version. As xinmsn have made some changes, it takes too long to load the file with thumbnails hence have removed them temporarily. both plex and xbmc versions updated. let me know if any problems. thanks! Anyway great work once again hopefully it can be as organise as before with the neat channels thumbnails cheers!!! Does not seem to be working for me. Using Plex on linux distro. I installed the channel and I can see it and bring it up but nothing will play. Perhaps some IP blocking or something but I read where you commented that this works for US viewers so not sure what is wrong. Any ideas? Here’s the latest version, you would need to install it via the zip install in xbmc as there are a number of other dependencies. last bit of code clean up before submit to xbmc repository. it should work? let me know if you encounter any problems please! Still get error, when go to channel 5/What do men want. – NOTE: IGNORING THIS CAN LEAD TO MEMORY LEAKS! StiLL got the same problem as the previous one whereby theres n0 series Listing when say ch5 etc was seLected. Thanks for informing. Let me check it out later tonight! Can you share more details of your setup and the problem you encountered? If XBMC, did you install via the official repo? I just tried channel 5 – mata mata and channel 8 – three wishes a minute ago and it was working fine for me. Via Official repo and Master(tried this first). The issue is Location on some of the shows. message: we are sorry, this video can not be played from your current location. Can a Proxy be added to this plugin? I had another plugin that lists almost the same shows as your addin and it stop working also, Or is this the same addon- it is call (Mediacorp TV Singapore Addon). Sounds like the same issue. I guess I should say it stop working , it is shows that stopped working. But other shows still work for me. By the way this is an excelling plugin, my wife likes it, so hopefully there is work around for the location issue. Thanks much Trevor for sharing. As compared to the Mediacorp one – we started development differently but have started seeing some synergies in working together. Scotty (the author of Mediacorp) is based in US and might be able to validate some of the proxy issues. We initially thought we worked around it with one of the HTTP calls. I am based in Singapore so testing is harder for geolocation issues. I was thinking of a workaround but would need some time to implement it as I need to use a US VPN to simulate it as well. Will report back once I am able to test it out. Any testing you need let me know. Also great App, good to hear you are working together. I had Mediacorp first and the link worked then it stopped. Seen you app and was able find out why it didn’t work. I am in vancouver and mata mata works but three wishes cannot … think its location issue. any way around this? I am a singaporean living in Vancouver. Can use Toggle but have to register with my sing i/c to watch. Really like your xbmc addon but so far cannot see the videos. anyway to add a registration like toggle to over come the geo restrictions? hi, great work on the xbmc plugin. any chance the plex.bundle will get updated? All versions updated – but Plex you would need to download from Github. What happened to the plugin? All the videos have disappeared? Is it only me or is anyone else having the same issue? Am sad that i can’t watch my shows. most the of the channels in the plex version from github dont seem to work. I can navigate to all the episodes, but the video doesnt play. gets stuck at 13%. I noticed that the xbmc version is newer than the plex version. Not sure if there have been updates for the streams that need to be migrated to the plex version. I’m still having issues with with plex version of this plugin. As far as I can tell, i think its due to plex being able to transcode the video stream. Is there anything i need to do get this to work? I’m in the US, if that matters. i have chrome browser on a windows 10 PC, and plex on a linux box. hi. i am malaysia user… now having issue unable to play for the last episode…is there any update for the plugin??? Hi! I am unable to watch anything as there seems to be no connection to the link? Is there any SGTV update for KODI krypton ? Hi, I can’t watch anything on SGTV live as well as the other past programmes on SGTV. It says “Playback failed”. I tried updating the add-on but to no avail. Previously I could still watch the live programmes but unable to watch anything now.